planes, trains, automobiles. . . but no ponies! on my birthday, i received from my son joseph (facebook friend 61) a somewhat mystifying series of packages. two maps, one of the world and another of the united states. and a package of pushpins. the accompanying note made the usual references to candles, wishes, years, many more, etc. and then “you know what to do with this”. . . which i thought i did. i unrolled both maps, took out the datebooks from 2011 and from this year. before i made the new year’s resolution to meet all my facebook friends and connect/reconnect in person, i was riddled with anxiety about leaving my house or leaving the little village of winnetka. i still am. i have used cars, trains, planes, buses to see my friends–but never a pony. maybe i need a pink one! my first trips were within illinois or to neighboring states of indiana, michigan, wisconsin, iowa and missouri. i had eight friends in kearney, missouri. still do! each trip i tried to be efficient–sort of like going to the dry cleaner on the way to the grocery store and stopping at the gas station on the way back. sometimes people who are solitary, shy, housebound for whatever reason can use facebook and other social networking sites to keep in touch with their friends and family. in my case, i used facebook as a substitute for being with my friends and family. on thursday, october 13, 2011 i flew from chicago to anchorage and drove southwest to the tip of the kenai peninsula to meet facebook friend 233 christy russ. we drank elderberry wine and ate fish that came from the harbor. 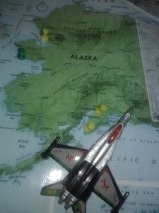 the next morning caught a flight from anchorage to kotzebue and beyond to meet facebook friend 234 ian coglan in nome. i was amazed at how many bars and tanning salons that town has. by eight a.m. sunday morning i was back in chicago. it’s hard to remember that this state is four times as big as texas! the best way to make a resolution to do something is to tell your friends and family and ask them to make you accountable. whether it’s losing weight, stopping the love affair with the nicotine sticks or the bottle, or meeting every facebook friend. so i am asking you–will you help make me accountable? This entry was posted on Thursday, July 26th, 2012 at 1:09 pm	and tagged with accountability, birthdays, facebook, friendship, journeys, maps, resolutions, travel and posted in Uncategorized. You can follow any responses to this entry through the RSS 2.0 feed. « happy birthday, mr. zuckerberg says! Look at the entries from your blog….you have already begun. I think you would be surprised how much you already have right here at your fingertips! Go for it! I so agree with your son!!! What a great suggestion – declare yourself and so you have to be accountable. We’ll be waiting with baited breath for news of your progress. I’m glad you made the leap before I suggested it– but I still hope to meet you! A book is an excellent idea!! I think u should’ve started it since ur first trip but its never too late!! go for it! Joseph is right, you have a potential to be a good writer. Just rest the thought of having trouble on finding a publisher, just write and see how it goes. I’ve been nudging about getting you writing for a while now. Does this mean I have carte blanche to ramp up to serious nagging? nag away! i welcome nagging. i am working on it! i now have an outline and tomorrow i am going to review those two chapters. i may have to start over. i was working with o.j. — you met him at the party. but he has disappeared. joseph’s point is that i need to do this one NOW.